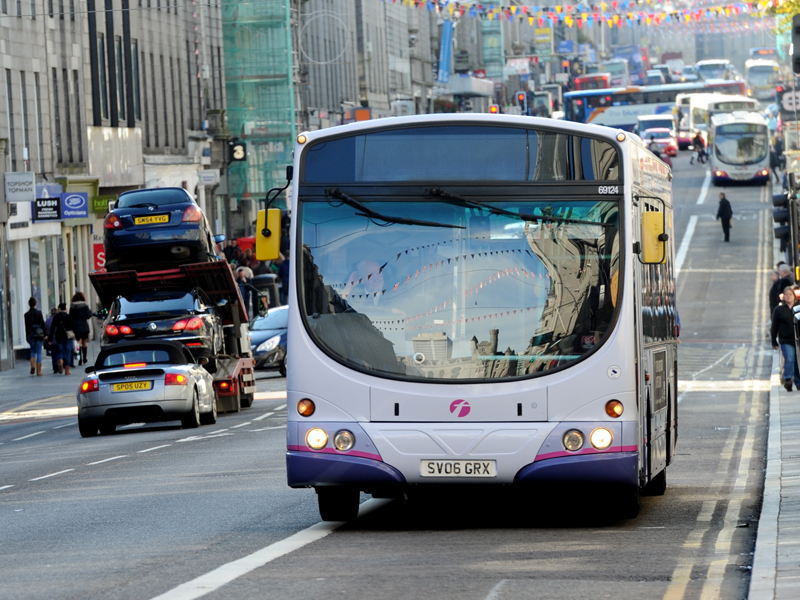 Fines totalling £2.48million have been issued to motorists in the first year of bus lane enforcement carried out by Aberdeen City Council. Figures have revealed that more than 3,000 drivers a month on average are still being caught flouting restrictions on key routes. The actual income for local authority coffers is expected to be closer to £1.2million, as most offenders pay up within the first two weeks – when the penalty is reduced from £60 to £30. Last night, the council’s finance convener Willie Young said the cash was being put towards badly-needed transport improvements. However, a spokesman for motoring body the AA questioned whether there were enough signs to warn drivers away from the bus lanes, and if visitors were being unfairly penalised. The total number of tickets issued was 47,726 – 27,473 from May to December last year and 20,253 up to the end of June in 2014. The figures show the biggest month for snaring offenders was the first four weeks of enforcement in May last year, when 5,536 drivers were caught out. The number of people fined gradually reduced towards the end of the year, but then spiked upwards each month from 2,453 in November to a high of 3,631 in March. A dip in April to 3,401 was followed by another increase to 3,699 in May, before the figure slipped back to 2,607 in June. There are 11 fixed camera points on routes around the city. These include main commuter arteries such as King Street, Wellington Road and Lang Stracht. A council spokeswoman said the increase in the number of tickets issued so far this year could be partly put down to a rise in the number of cameras. In May last year, there were only four cameras which were rotated around the 11 fixed sites, with another single mobile camera also in use. However, in January, an extra four cameras were introduced. The spokeswomen said the council figures showed that fewer motorists are being caught per camera, but the total number is rising because there are more cameras. Council officials expect the number of offenders to drop in the months ahead. By comparison, however, in Glasgow and Edinburgh, there has been little drop-off after two years of operation. Luke Bosdet, a spokesman for the AA, said more information was required to fully analyse the statistics, but said “something was not working” if more than 3,000 drivers a month were still being caught. He said: “The first thing to bear in mind is the idea of a fine is not to fill council coffers, but to deter people from going in so the bus lanes work effectively. “But I would question if the signage is good enough for people to realise they are about to wander into a bus lane, and also where the tickets are being issued. Are they at junctions where people don’t have an option but to enter into bus lanes, or don’t understand and regularly make mistakes? Mr Young, said: “We would prefer it if nobody got caught, we want people to abide by the law. “The problem is many people are not abiding by the law, they are cheating, and in substantial numbers. “We are using the money from fines to deliver road improvements to try and make sure we get a better system of traffic management in the city. Conservative councillor Ross Thomson said he would support a call to assess whether bus lane signs were visible enough. “It is a large amount of money to have come from fines. If drivers are being caught out unintentionally, then that is something that needs to be looked at. “If these are drivers that are following the Highway Code, and the signs aren’t obvious, then that is not fair.